Today, Donald Burke, Esq., filed a lawsuit and an order to show cause in United States District Court on behalf of Bergen County Sheriff's Officers James Tassillo, Alvin Nunez, and Elby Tineo. The three were denied access to the Bergen County Administrative Building on October 23, 2014 because they were wearing shirts in support of Freeholder Jim Tedesco (who is seeking election to the office of County Executive on November 4, 2014). James Giblin, the Assistant Director of Security, denied the three men access to the building citing that the building was a polling place and they were wearing political advertisements (which were prohibited within 100 feet of the entrance). The Deputy Attorney General has since weighed in advising the Superintendent of Elections, Patricia Dicostonza, that Giblin's assertion is inaccurate and that the County Administrative Building is not a polling place on a day that is not Election Day, a primary, or Board of Education election. Bergen County Police Chief Brian Higgins told Cliffview Pilot that he disagreed and that the three Sheriff's Officers were also in violation of the ethics code of the County Administrative Code which "prohibits county employees from conducting such activity on county property." In the suit Burke contends that "this interpretation of the County Code, prohibiting Bergen County employees from expressing support for candidates for public office while off duty and out of uniform is an unconstitutional infringement of the free speech rights of Bergen County employees and such a statement is intended to and does chill protected speech." Burke goes on to state that these claims by Higgins "constitute threats, intimidation or coercion made unlawful by the New Jersey Civil Rights Act." and stopping the defendants from making further threatening, harassing, or intimidating statements regarding the plaintiff's attempts to engage in protected speech and expressive activities. The matter was scheduled to be heard on Monday, November 3, at 2:00 pm. However, with the administrative building being open this weekend and County Counsel contending that the County would continue to restrict access to the building based on political speech (despite the Deputy Attorney General advising the building is NOT a polling place), Judge Salas ruled today on Burke's 21 page brief and issued the order for injunctive relief. Until Election Day, no person shall be denied access, or otherwise be harassed or intimidated, based upon their expression of constitutionally protected free speech. The lawsuit against the County of Bergen, Kathleen Donovan, Brian Higgins, Bergen County Police Department, James Giblin, and John Does 1-10, will move forward. On October 23, 2014, Bergen County Sheriff's Officer Romero attempted to enter the Bergen County administration building to attend a breakfast honoring county employees. Romero is an 11 year veteran of the Bergen County Sheriff's Department and supporter of James Tedesco who is up for election for the office of Bergen County Executive on November 4th. Romero was denied access to the building by Bergen County Police Officer William Pepard and Bergen County Security Officer James Giblin because he was wearing a shirt supporting Tedesco. 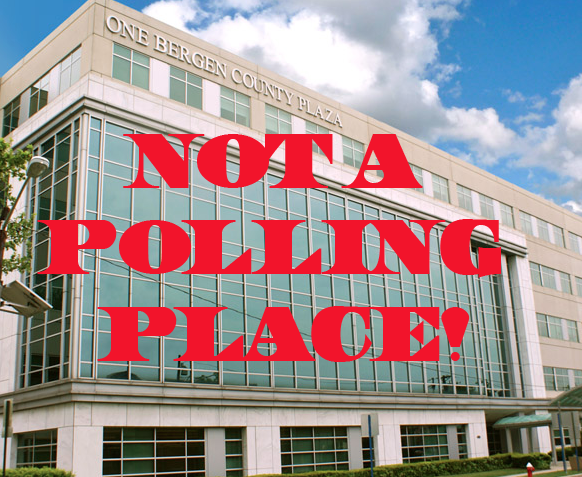 Giblin and Pepard have contended that the county administration building is a polling place and according to Title 19 political advertisements can not be displayed within 100 feet of the entrance to a polling place. Romero filed a lawsuit today claiming his civil rights and constitutionally protected right to free speech had been violated. 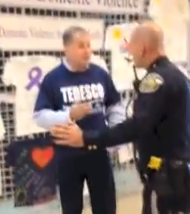 Community activist Bill Brennan went to the county administration building today donning his "Tedesco for County Executive" regalia and the Bergen County Police attempted to stop him from entering the building. They detained him and threatened to charge him with a disorderly persons offense.... Until of course Bill Brennan steam rolled the opposition with the facts and the law. Brennan demanded an opinion from the Superintendent of Elections. The Superintendent of Elections, Patricia Dicostanzo, offered the final word on the matter. Though the county administration building is a place where voters can cast their vote, it is only a polling place on election day. Dicostanzo advised that she confirmed the same with the Assistant Attorney General. Question--WHERE IS COUNTY COUNSEL?!?! Four Sheriff's Officers were denied access to the building because of their political speech and one resident was unlawfully detained and questioned? All this because they were voicing their support of a candidate for office? Good job! What is this going to cost the taxpayers of Bergen County?!? The Bergen County Police Department is clearly wrong and has continued to attempt to deny residents their constitutionally protected rights to free speech in this highly controversial election season (that by the way they have a vested interest in the outcome of as the merger of their department is the most hotly debated items between the candidates). The Hackensack Scoop broke the first story regarding potential conflicts of interest that arose out of Thom Ammirato's multiple public employments (North Arlington, Hackensack, and the County of Bergen). The issue quickly unraveled into an investigation by the Bergen County Prosecutor's Office which concluded with an agreement not to prosecute Ammirato in exchange for his resignation. 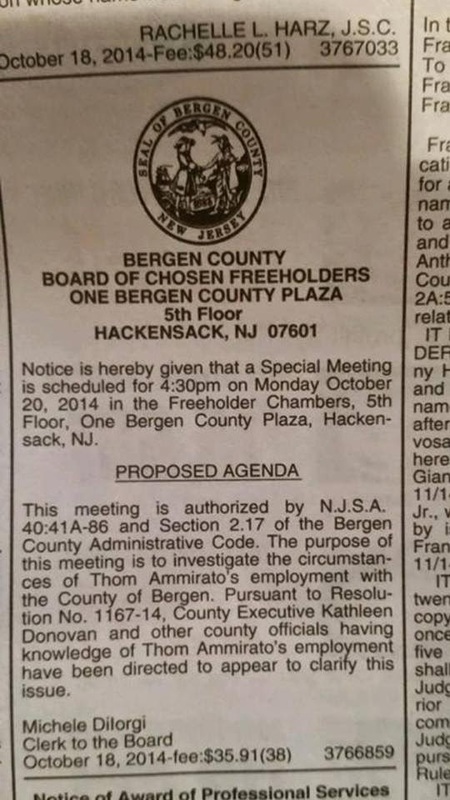 Last week, as this information regarding the agreement not to prosecute came to light (again uncovered by The Hackensack Scoop), the Bergen County Board of Chosen Freeholders demanded that Kathe Donovan appear to answer questions regarding Ammirato's "no show" job. Despite acknowledging that the Freeholders have the right to summon her before the board to answer questions, Donovan appeared only briefly today to provide information which was already available and to advise that she would not participate in person with their inquiries. Donovan's cohorts (Baratta, Kornfeld, and Kezmarsky) who were all served with Rice Notices were no shows for the hearing (they sent attorneys in their place). Donovan and her cohorts, rather than facing the music, have done nothing more than attempt to delay until after the election. Today, the group's non-compliance forced the Bergen County Board of Chosen Freeholders to pass a resolution authorizing county counsel to go to court seeking an order to show cause (wasting more tax dollars) to compel Donovan, Baratta, Kornfeld, and Kezmarsky to comply with their legal obligation to answer the board's inquiries. Freeholder Tracy Zur called the need for legal action to compel the County Executive to comply, "so unfortunate." Zur went on to say that whenever the board seeks information from the County Executive they are "encountered with a stonewall." Zur, who offered the motion, says she did so with frustration and in an attempt to "engage in an inquiry on behalf of the taxpayers of Bergen County." Denicola, in an apparent attempt to diminish the importance of guarding the taxpayers' purse, called the move political and deflected the focus of the meeting to no bid contracts and public relations fees. Denicola was the lone no vote in compelling Donovan to answer the board's inquiry and was again the lone no vote in the resolution to authorize county counsel to seek legal remedy for Donovan's noncompliance with her duty to participate in the Freeholder Board's inquiry. What I am having a hard time reconciling is if Denicola's no votes were more for the political protection of Donovan, or Ammirato. Denicola has a professional relationship with Thom Ammirato. 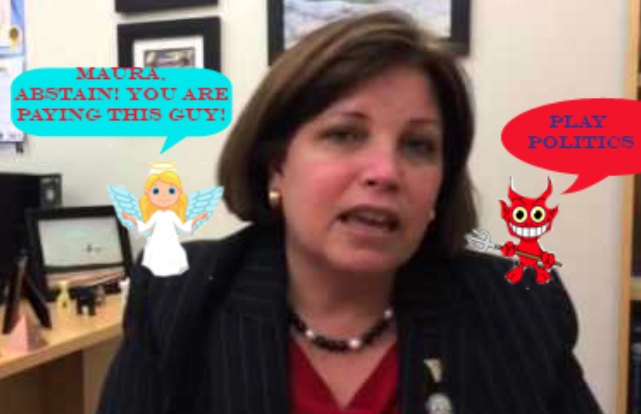 Denicola paid Ammirato's firm (The Write Associates) more than $5,000 in consulting fees during last year's election season (while Ammirato was under the controversial employ of the County of Bergen)... With this professional relationship, how could she not have abstained? Denicola did not answer a request for comment as of the publishing of this story. Jim Tedesco, the Democratic candidate for Bergen County Executive, today hosted a news conference to address the slanderous television commercial and mass mailing issued by Kathe Donovan. He also highlighted the success of the affordable housing facility and how it benefits dozens of local families. Paramus used $3.6 million of COAH funds, which come from developer’s fees and not tax dollars, to build Parkview Residences on Ann Court – a project that was completed in partnership with the county and the state. The facility contains a total of 48 affordable housing units for low to moderate income families. 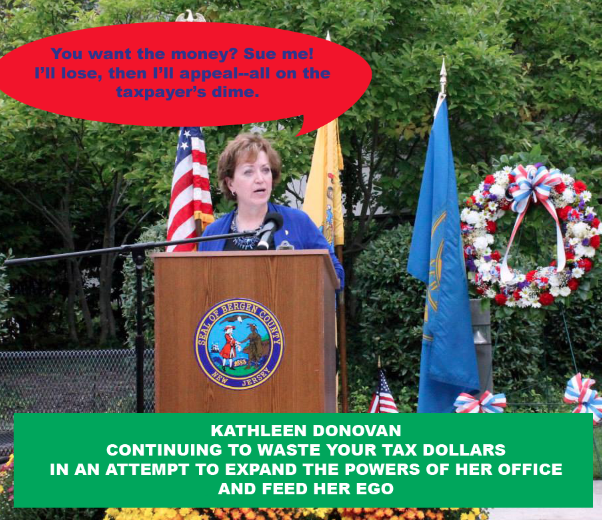 Adding insult to injury, Donovan also criticized Tedesco for not paying his taxes. The fact of the matter is that when Tedesco’s wife was in need of a double lung transplant and dying, the family lost sight of a $500 bill that was later paid. Tedesco says these lies and insensitive remarks are proof that Kathe Donovan is "willing to say anything regardless of the truth in an attempt to win an election." Boys and Girls Club Recognizes Police Director Michael Mordaga as "Man of the Year"
Mordaga's award was presented by Hackensack's former City Manager, Steve LoIacano. 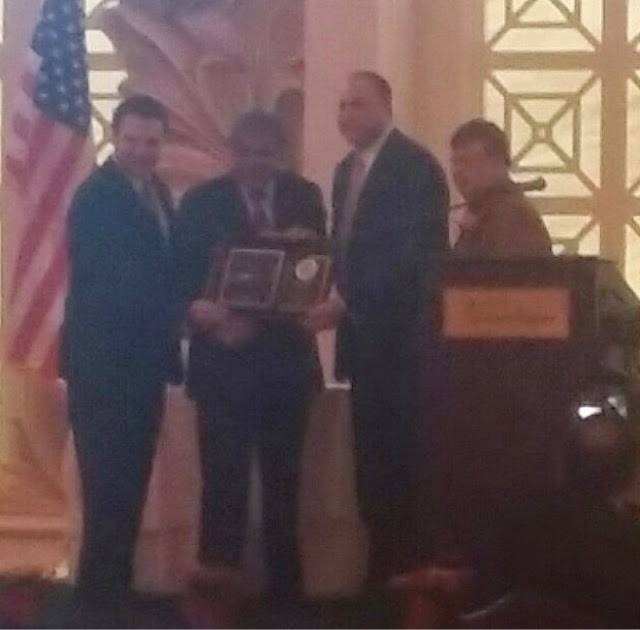 LoIacono spoke not only of Mordaga's accomplishments in law enforcement but of his triumphs on behalf of local youth. 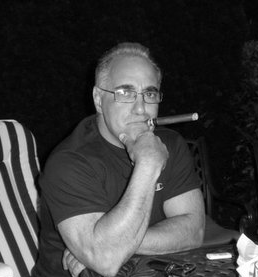 Mordaga is the founder of the Bergen Police Athletic League (PAL). The PAL focuses on keeping kids off the street. The PAL offers after school programs, youth leadership programs, and special programs for at-risk youth. LoIacono noted that Mordaga's efforts in founding and developing the PAL has taken literally hundreds of youth off the streets. In a true showing of class, Mordaga humbly accepted his award offering, instead of a speech, nothing but thanks and gratitude. Mordaga recognized those around him who have helped to not only make these accomplishments possible but have made every day a joy. 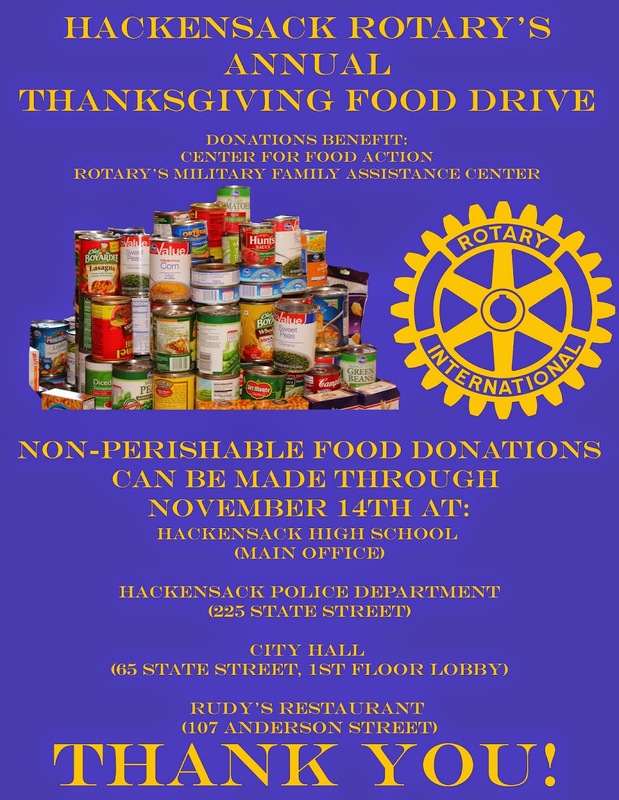 The Hackensack Rotary is hosting its annual Thanksgiving food drive. Non-perishable food donations will benefit the Center for Food Action and Rotary District 7490's Military Family Assistance Center. If you, your business, or your organization are interested in getting involved, please contact Steve Gelber. In 2011, the City of Hoboken adopted a resolution delineating "an area in need of rehabilitation." Neumann Leathers, a business located within the area, challenged the City's compliance with the law in their delineation of the area. On September 23, 2014, the Appellate Division of the New Jersey Superior Court published their decision in the case, ruling in favor of Neumann Leathers. On the day of the court's publication of the decision, I provided a copy to the City Attorney, Mayor, and Deputy Mayor. I questioned how this decision may impact actions that the City of Hackensack had already taken to name certain areas of town as areas in need of redevelopment/rehabilitation and how the decision may impact current, and future, development projects. Since September 23rd, the only reply I have received was a thank you for sharing the information from the Deputy Mayor. Tonight, I presented my same question to the City Attorney, Joe Morris. I went on to ask if the City Attorney had reviewed the decision with the Planning and Zoning Board attorneys and discussed past projects and revisions to plans for current and future projects to ensure compliance with the law. Morris declined to comment as it seems the appellate decision is already the subject of a complaint filed this week by local Hackensack property owners challenging the legality of the redevelopment of 150-170 Main Street. Frank Callahan, Danny Callahan, and Michael Monaghan are local business and property owners with properties at 50 Main Street, 62-64 Main Street, and 59-61 Moore Street. They acquired certain properties in 1999 and spent considerable time and money performing environmental remediation. Subsequently, they secured lease agreements with a number of tenants and submitted plans for approvals of development. The city has continued to deny their plans and has been embattled in litigation with the property owners for at least six years. Last year, the property owners successfully challenged the city's designation of 163.8 acres in the downtown area an area in need of redevelopment. The city is currently appealing that decision. It is alleged that the continued litigation is a result of animosity between the property owners and the Zisa family. Parties with knowledge of the property history have alleged that bad blood was created by Jack and Ken Zisa with the property owners over former Mayor Jack Zisa's personal disagreement with the owner's intended construction of a second floor at 50 Main Street more than ten years ago. Now six years into protracted litigation with countless legal fees spent, this new lawsuit (which potentially presents serious implications for the redevelopment of the city), seems to provide Monaghan and the Callahan's with the upper hand in forcing a settlement of their six (YES, SIX) outstanding lawsuits with the city. The current suit, if not swiftly disposed of, may very well halt redevelopment and spook potential developers interested in investing in downtown Hackensack. The Scoop is currently reviewing and analyzing the legal fees spent in the six cases as information obtained points to potential glaring irregularities in the billing practices as the number of special litigation counsels rises. Kathleen Donovan's office is responsible for the production and publication of a newsletter, Bergen Blast. The Election Law Enforcement Commission deems these types of communications, when distributed within ninety days of an election, to be an in-kind campaign contribution, even if it does not contain an explicit appeal for the election or defeat of a candidate. The cost of producing the newsletter was incurred by the County of Bergen and it is illegal for a public entity to make political contributions. The Fall edition of the Bergen Blast, which was distributed within ninety days of an election, is five pages in length yet features Kathleen Donovan’s name twenty seven times as well as her photograph eight times. The Summer edition of the Bergen Blast, which was also distributed within ninety days of an election, is four pages in length yet features Kathleen Donovan’s name seventeen times as well as her photograph seven times. Donovan has reimbursed the County of Bergen the $878 in printing costs that were incurred in printing the Fall newsletter, however, the Bergen Record has reported that she will not reimburse the County of Bergen for the cost of the five staff members' time in producing and publishing the newsletter. Tonight, the Bergen County Board of Chosen Freeholders passed a resolution demanding that County Executive Kathleen Donovan reimburse the County of Bergen for the cost of two editions of the Bergen Blast, deemed political propaganda, which were illegally produced using taxpayer funds. The resolution orders the County Executive to immediately remove both editions of the newsletter from the county website and calls upon the County Treasurer and County Auditor to prepare a full accounting of the cost of production of the newsletter for the Freeholders. Upon receipt of the audit, the Freeholder Board will pursue reimbursement of the costs from the County Executive. The resolution was passed with four yes votes and one abstention from Freeholder Maura Denicola. Freeholder Denicola's abstention is a clear message that she has placed political alliances above good governance. Freeholders Tanelli and Felice were absent from tonight's meeting.